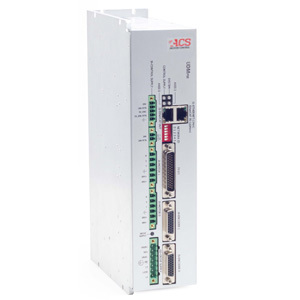 UDMpm - A line of EtherCAT modules with single/dual axis universal drives. It is offered with two current levels: 5A/10A (cont./peak) and 7.5A/15A. An optional Safe Torque Off (STO) feature cuts the power to the motor without removal of the motor power source to comply with SIL-3 and PLe safety levels. It is powered by a single phase 85 to 265Vac input and a separate 24Vdc control supply input that keeps all logic signals alive during emergency conditions. It supports a wide range of position feedback devices: incremental digital, analog (SIN-COS), absolute encoders and resolvers.